During 2018 we initiate a nordic network for small-scale and self-organized organisations within the field of art, working proactively in relation to current political challenges. In a changing political landscape and with the challenges it brings, small-scale and self-organized initiatives within the art eld are particularly vulnerable. Both because of threats of violent actions but also because of possible reductions in public funding. What happens when the cultural policy map is redrawn and the support that the organizations traditionally relied on suddenly are withdrawn? How do other cultural actors and the rest of civil society relate to a similar potential scenario? How can we work proactively in a larger network, where we develop new strategies and continue to work with the aim that art is for everyone? AOOO is initiated by Art Lab Gnesta and Konstfrämjandet. It brings together self-organized and small-scale organizations and collectives within the field of contemporary art in the Nordic region. By meeting, exchanging experiences and knowledge, the network is trying to nd new strategies, create resilience and work proactively against the abstract and concrete threats our operations are facing. The network will organise three meetings in the Nordic region during 2018-2019, developing new strategies and laying out the foundation for a growing network. The first meeting was held may 3, 2018 at Iaspis in Stockholm. Network meeting #2 at HIAP in Helsinki on Saturday September 15 at 10.00-18.00. 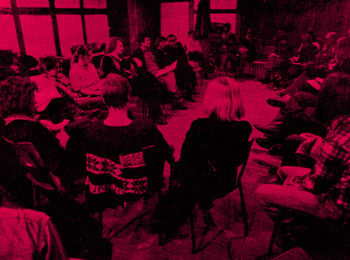 The network consists of Konstfrämjandet (SE), Art Lab Gnesta (SE), UNICORN – Artists in solidarity (SE), Skånes konstförening (SE), Studio 17 (NO), MUU – Artists Association (FI), UKK – Unge Kun- stnere og Kunstformidlere (DK). With support from the Nordic Culture Point.